Kenneth Buntin and his brand-new coconut cream chocolates. 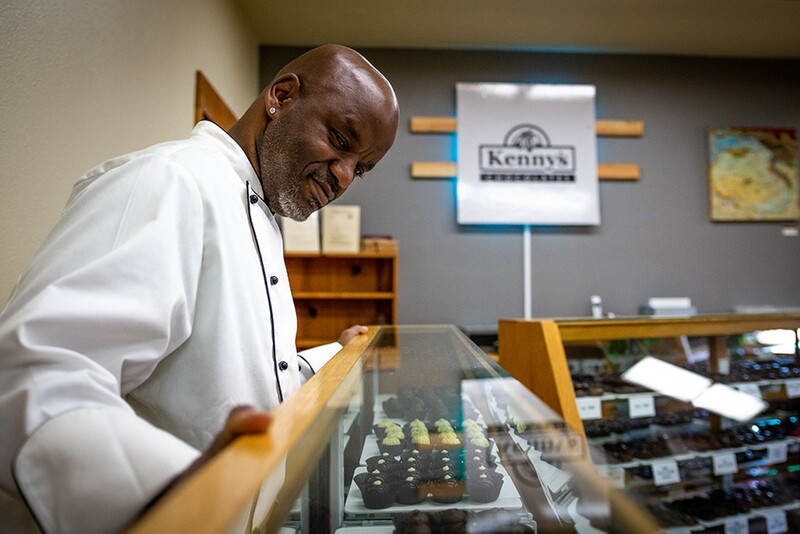 Kenneth Buntin smiles down at the row of new chocolates in the case, domes of milk and dark chocolate filled with ganache-like old fashioned creams — orange, hazelnut, vanilla, ginger and blackberry. While he's tweaked and refined the recipes over 25 years in the same kitchen in Old Town's Snug Alley, these are the first of his own creations to be sold under his own name. 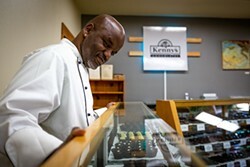 The smile keeps creeping up to his cheeks as he moves behind the counter and over to the new signs that say Kenny's Chocolates. About 17 years ago, Buntin moved as a teenager from Indiana, where he grew up with his mother, to live with his father and stepmother in Humboldt, and graduated from Eureka High School. His father cooked at the former Panama Jack's and a few other places in Humboldt, footsteps Buntin thought he might follow in one day. Buntin, who is African American, recalls his father's job cooking at an overwhelmingly white country club back in Indiana, too. "Everything you did had to be perfect," he says. "It was beautiful. When he would come home and cook, it was the same way. It was beautiful. With my mom's [cooking], she went with flavor." The balance of beauty and flavor, Buntin says, is something he's always thinking about. "I didn't understand that growing up but now I do." At 19, Buntin was planning to head back to Indiana but he needed a job and applied to work at Sjaak's Organic Chocolates. There, apprenticing at founder Jaques Holten's side, Buntin found a fit for his knack for cooking, art and machines. Holten, who trained in Europe, had written lists of ingredients but his instructions were all verbal, sometimes in a kind of code referencing other recipes. "It was almost like I had to read his mind," he says. The two worked in tandem for years, Buntin learning the methods for each candy by heart. He recalls the first chocolates he was allowed to make on his own in the shop: truffles. The method came easily to him, rolling the cut cube of chocolate in two hands and dipping and turning the ball in chocolate just so. "Those things, it's like Zen. You sit there and can zone out," he says with a laugh. They're still his favorite sweet to make. Eventually he was making most everything on his own and practicing decorating in the empty shop at night. He even learned some things Holten never taught him, like raising the temperature for caramel one degree if it's raining. For Buntin, Holten had become a father figure so he felt blindsided by the sale of the shop he'd staked his future on for two decades. It was then that Buntin first attempted to buy the storefront operation, then called Venlo Chocolates. But, as Buntin says, "At that time I wasn't credit worthy. I wasn't in a position because I wasn't thinking about that." Buntin was on his way out the door when Jonah Ginsburg bought the shop in 2013 and convinced him to stay on board to run the kitchen for Humboldt Chocolates. The family atmosphere in the shop had returned and Buntin still loved the work. But the itch to run his own shop and create his own recipes never left. "I can't be as creative as I want to be when I'm working for someone else," he says, "even though [Ginsburg] let me do what I wanted to do and kind of experiment, still I felt stifled because that takes time, working for two hours just to make one chocolate." Not to mention that anything he made on the clock for Humboldt Chocolates wouldn't be his anymore. For months, Buntin had been trying to secure a space at Arcata's Foodworks Culinary Center so he could reduce his hours at Humboldt Chocolates and work on his own creations. But, to his surprise, when he shared his plans, Ginsburg asked if he still wanted to buy the shop. "He did not have to do this. ... The business that Jonah built, technically he could have done it without me," admits Buntin, adding that Ginsburg also shared financial information to make the transition easier. "I don't think he wanted to keep me where I was. He knew I wanted to fly and I'm forever in his debt for that." If you're struck with panic at the thought of those chocolate espresso bars vanishing, calm yourself. 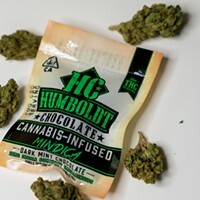 "It's still here, I'm gonna be making Humboldt Chocolates," says Buntin. "But the retail store is gonna have a sign that says Kenny's Chocolates ... You'll still be able to get the stuff you've been getting." All five employees at the 425 Snug Alley shop are staying on, too, including Selfida Pax, who's been making chocolates there for more than a decade. And now Buntin will have time to experiment and create. So far, Ginsburg is pleased with how things have worked out, too. "Now Kenny is functioning like a contract manufacturer for me. It was great because I got to keep it ... local. It really worked out for me," says Ginsburg, noting that he might otherwise have had to move the whole operation elsewhere. "I'm happy to keep it here and handmade and hand wrapped and all of that," he says, especially because of the employees. "I didn't want to just use those people for five years for my benefit and then dump them." The windows in the back of the shop offer a glimpse into the kitchen where three tempering machines are steadily stirring liquid milk, white and dark chocolate amid towering racks of truffles and chocolate skulls awaiting decoration for Halloween and Dia de los Muertos. Buntin walks between the work tables as at home as anyone could hope to be after a quarter century. He's looking forward to bringing in more ganaches and playing with new flavors, like caramels made with cream. Working with chocolate is still exciting for him. "It makes me feel free. I have to know what I'm doing and do it all right or else I'll have blooming and all kinds of problems. ... When I get it right, it just makes me feel empowered," he says. "I wake up thinking about chocolate."